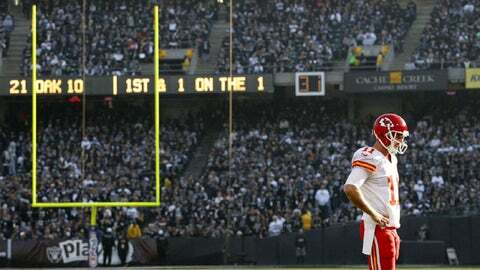 Alex Smith posted a perfect passer rating -- 158.3 -- in Sunday's win over Oakland, but history is more likely to remember Jamaal Charles' big day. Yes, among the myriad of goofy official NFL statistics, the passer rating is among the goofiest. Like ERA or batting average in baseball, it’s been supplanted, over the generations, by better metrics. Not all "perfect" games are created equal, even though the Chiefs have now only seen three of them over the past 50-odd seasons. The perception is that Smith is a dink-and-dunk artist. The reality is that people focus too much on the "dink-and-dunk" part of the equation and not enough on the "artist" part. "I didn’t do much," Smith told reporters after the game. "I mean, three screens for touchdowns. I’ve never been a part of anything like that or seen that." Doubt, of course, he’s seen plenty of. The Chiefs (11-3) are a good story, and Smith has been one of its central players, through thick and thicker. Ultimately, though, he will be judged — or redeemed or cursed — by January. He knows this. Reid knows this. Warpaint knows this. The candy wrapper in the stairwell knows this. Itâs not fair, itâs not kosher. It just is. What pitching is to The Show in October, signal-callers are to the NFL in January. If the Chiefs should leave the AFC’s postseason party after one game (again), out will come all the "Smith-is-just-a-game-manager" labels (again) — and that’ll be among the nicer things that get tossed into the ether. The radio types will call him a passenger on the S.S. Reid, insist that No. 11 just piggybacked his way into the postseason party on the backs of a historically salty defense and Charles’ mighty cleats.